Created for the dieter who would rather follow science than the latest fad or celebrity, this book synthesizes years of research to present one dependable weight loss plan that really works. Using a combination of consistently proven diet and exercise strategies that require no special props or aids, readers are shown reliable ways to get weight off and keep it off. Information on calculating calorie needs, determining BMI (body mass index), and working out percentages of fats, carbs, and proteins in a diet are offered. The author leaves nothing to hypothesis, giving the truth about cellulite and how to tell when one's weight is a health risk. Fact is better than fiction where successful weight-loss is concerned and this book delivers all the scientific findings concisely in a convenient format. This book analyses weight-loss research to present one dependable plan that really works. Now you can take weight off and keep it off using a combination of proven diet and exercise strategies that require no special props or aids. Information on calculating calorie needs, determining BMI (body mass index) and working out the percentage of fats, carbs and proteins in your daily diet are included. This book is based entirely on: an analysis of scientific studies, so that it is fact-based; research on successful dieters that shows how they got the weight off and kept it off; and, diet and exercise strategies that can be done at home. What is currently on the market - a lot of diet and weight loss books with gimmicks and a lot of fluff, but very few theories that are supported by randomised controlled trials. 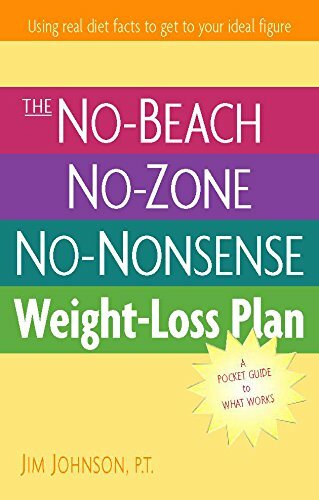 "No-beach, No Zone, No Nonsense Weight Loss Plan" is the antithesis of these books. The author has reviewed the weight loss literature, found proven solutions and put it all in a digestible format for the lay person.